But the center of gravity in my opinion is not the N of the Black Sea – it is the Cucuteni/Vinca/Hamangia area, ie Old Europe around present day Romania, which is the area with BIGGEST population. I2 is the basic layer which absorbed first the J1/E1/G neolithic farmers that came from Middle Asia producing the Old Europe civilization. This is the FIRST BIG BANG, based on FARMING the first mixture that produced a stronger culture, better technologies, better living conditions, population growth!! 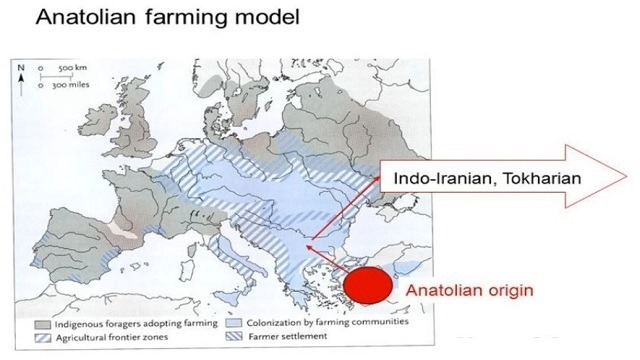 The farming, the east shores of the Black Sea and the lower Danube basin produced the biggest population growth &concentration whichlater started to expand, to Western Europe – the ProCelts and than through the Aryan migrations, to the Pontic Caspian steppes and down to the vedic and iranian cultures. The Cucuteni culture also had a big asset – SALT. The Salt Industry is essential for the Second Big Bang!! First Cucuteni started to develop farming and living close to the salt area in the Carpathians, but slowly they were able to transport the salt to the Dniester, Don are and further. The provision of salt was a major logistical problem for the largest Cucuteni-Trypillian settlements. As they came to rely upon cereal foods over salty meat and fish, Neolithic cultures had to incorporate supplementary sources of salt into their diet. Similarly, domestic cattle need to be provided with extra sources of salt beyond their normal diet or their milk production is reduced. Cucuteni-Trypillian mega-sites, with a population of likely thousands of people and animals, are estimated to have required between 36,000 and 100,000 kg of salt per year. This was not available locally, and so had to be moved in bulk from distant sources, probably from the Carpathian Mountains by river. romanianhistoryandculture.com/indoeuropean Sites: A]Mikhailovka, B] Petrovka, C]Arkhaim; D]Sintashta, E]Botai, F]Namazga, G]Gonur, H]Togolok, I]Dashly Oasis, J]Sapelli, K]Djarkutan, L]Hissar, M]Shahr-i-Sokhta, N]Sibri, O]Shahdad, P]Yahya, Q]Susa. 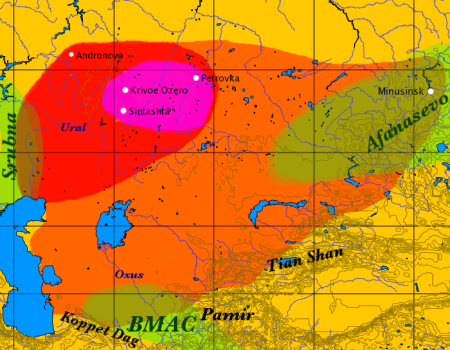 The Afanasievo culture is the earliest Eneolithic archaeological culture found until now in south Siberia. Radiocarbon estimates give a date of around 3300 BC for the start of the culture. The culture is mainly known from its inhumations, with the deceased buried in conic or rectangular enclosures, often in a supine position, reminiscent of burials of the Yamna culture. Settlements have also been discovered. The Afanasevo people became the first food-producers in the area by breeding cattle, horses, and sheep. Metal objects and the presence of wheeled vehicles are documented. These resemblances to the Yamna culture make the Afanasevo culture is a strong candidate to represent the earliest cultural form of a people later called the Tocharians. The Afanasevo culture was succeeded by the Andronovo culture as it spread eastwards. 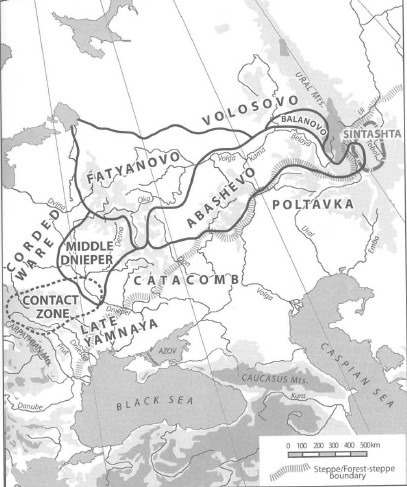 The Abashevo culture is a later Bronze Age (ca. 2500–1900 BCE) archaeological culture found in the valleys of the Volga and Kama River north of the Samara bend and into the southern Ural Mountains. Artifacts are kurgans and remnants of settlements. The Abashevo culture does not pertain to the Andronovo culture and genetically belongs to the circle of Central European cultures of the Fatyanovo culture type corded ware ceramics. The economy was mixed agriculture. Horses were evidently used, inferred by cheek pieces typical of neighboring steppe cultures. The population of Sintashta derived their stock-breeding from Abashevo, although the role of the pig shrinks sharply. It follows the Yamna culture and Balanovo culture in its inhumation practices in tumuli. 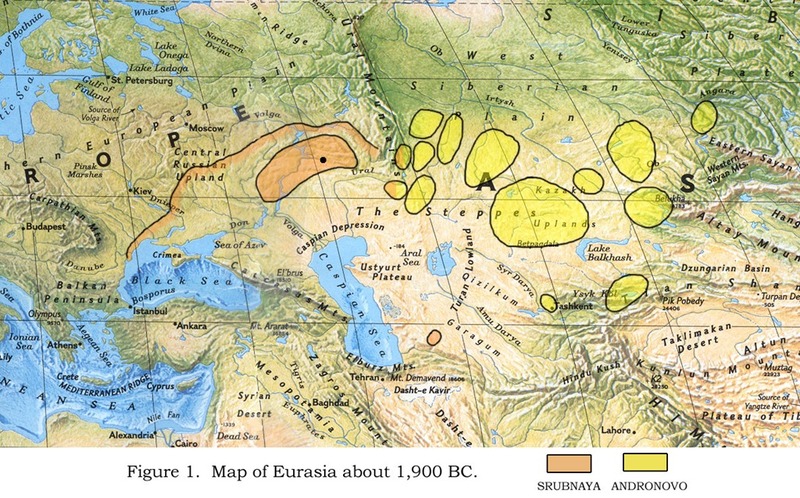 There is evidence of copper smelting, and the culture would seem connected to copper mining activities in the southern Urals. The Abashevo culture was an important center of metallurgy and stimulated the formation of Sintashta metallurgy. 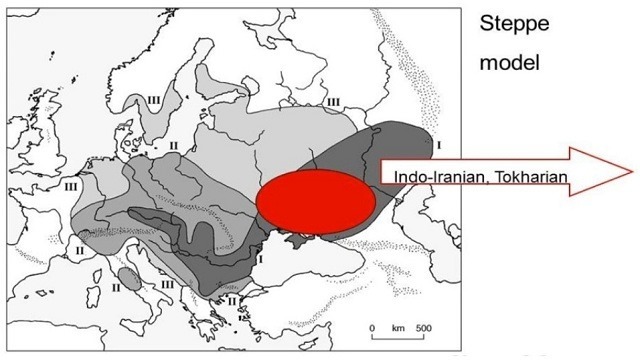 The Abashevo ethno-linguistic identity can only be a subject of speculation, reflecting both northern penetration of the earlier Iranian steppe Poltavka culture as well as an extension of Fatyanovo-Balanovo traditions. It was preceded by the Yamna culture and succeeded by the Srubna culture and the Sintashta culture. 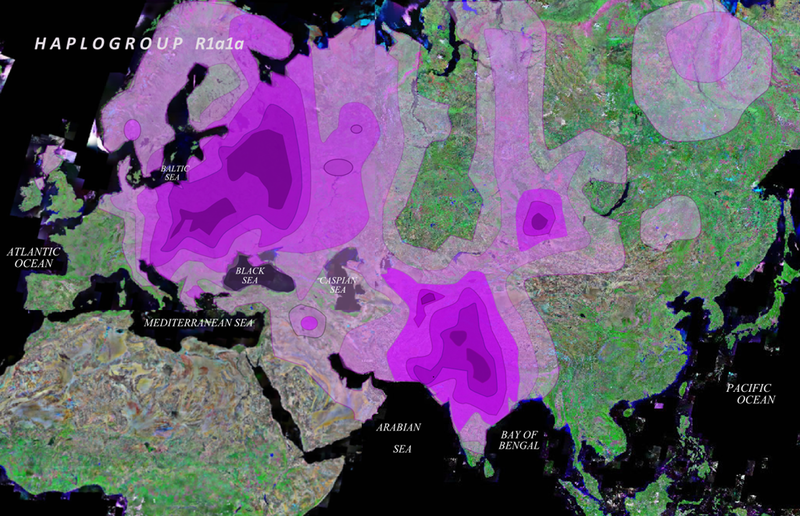 The last Ice Age covered most of the Eurasia, the Europe population was reduced to a few pockets of resistance. When the ice started to retreat all Europe was re-colonized from the Danube/Carpathian are with I1/I2 populations. So first we have the first big-bang – I2 Europeans absorb the J1/E1/G migrations form Middle Asia, we have the first technologies, farming and pottery. 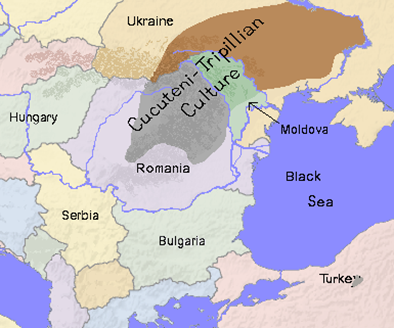 Based on salt the Cucutenians go East to the fertile areas north of the Black Sea where they meet the R1b people coming form the S of Caspian sea and the R1a hunters from the northern forest steppes. 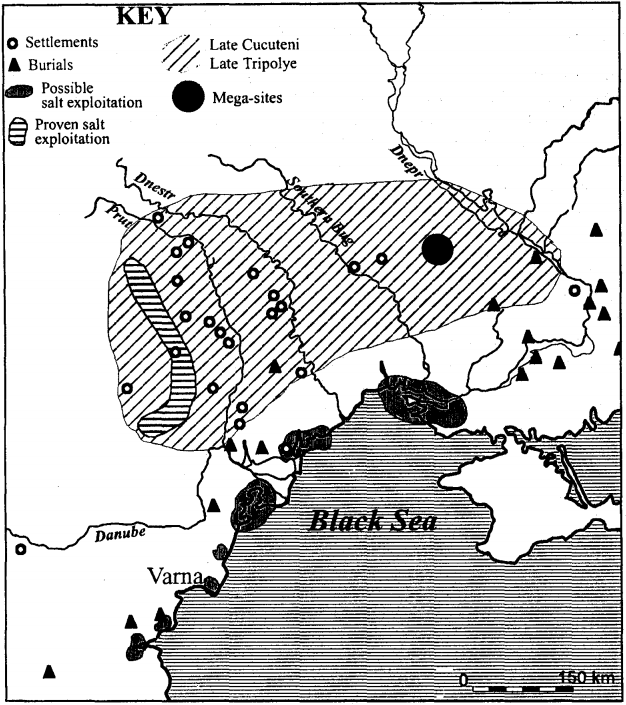 The second big bang is based also on a second wave of ”technologies”: the Salt mining coming from the Carpathians and the horse domestication coming from the Sredny Stog culture on Dnieper. Farming + salt/food preservation + transportation/trade + ”a sparkling ethnic mixture” produced POPULATION GROWTH and competition which will produce EXPANSION. This Second Big-Bang will expand to East, to the next basins that are offering good living conditions – Donets, Volga, Caspian Sea steppes, Aral Sea and the Oxus/Amu_Darya, and down to Indus and Middle Asia again. The I2/R1a/R1b mixture is not based so much on farming, it is based on animal herding and horse domestication with transportation based on primitive chariots. At about 2000BC we have a THIRD BIG-BANG the Aryan Getes going east develop the ”modern chariot technology” AND copper mining and bronze metallurgy while they mix with asian populations. They are retracing the R1b route, going back the original area of R1b, where they will meet again with big farming culture/cities of BMA Complex. The peak of this culture will produce the amazing Arkaim/Sintashta cities. The Arkaim/Sintashta cities/area, are based on copper mining, arsenical bronze industry and on the trade with the rich BMAC farming cities/areas. The empires and city-states of Iran and Mesopotamia provided an almost bottomless market for metals. 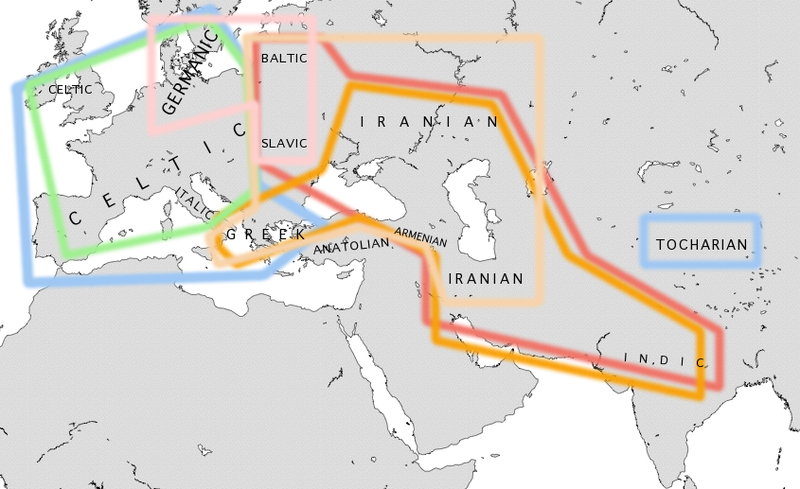 These trade routes later became the vehicle through which horses, chariots and ultimately Indo-Iranian-speaking people entered the Near East from the steppe. 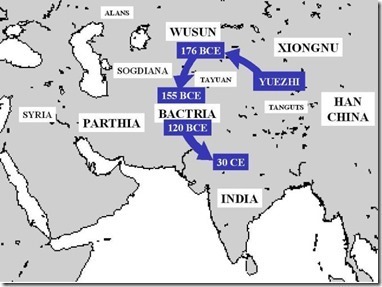 The Bactria–Margiana Archaeological Complex (or BMAC, also known as the Oxus civilization) is the modern archaeological designation for a Bronze Age civilization of Central Asia, dated to ca. 2300–1700 BCE. The inhabitants of the BMAC were sedentary people who practised irrigation farming of wheat and barley. With their impressive material culture including monumental architecture, bronze tools, ceramics, and jewellery of semiprecious stones, the complex exhibits many of the hallmarks of civilization. In the same time Arkaim features sewerage, fireproof impregnation of walls and other technologies. 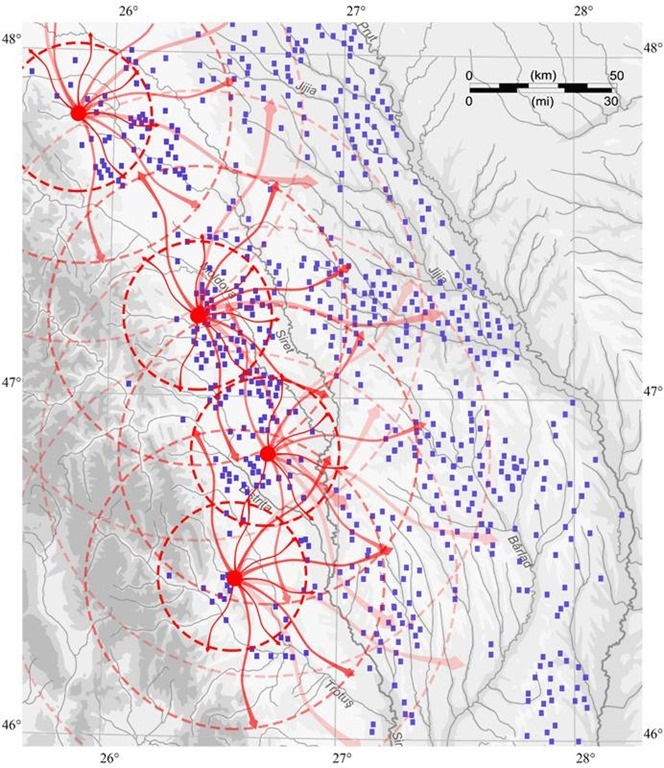 Climatic pressure, maybe pressure from asian populations, the attraction of the rich BMAC cities probably pushed the Getes to migrate south. Around 1700BC #1-Arkaim is suddenly abandoned, #2 it’s the end of the BMAC culture and #3 we have the first aryan migration into the Indus valley! This is the FOURTH BIG-BANG, the mixture between ”kurgan Aryans” with farming southerners, the Getes will become MassaGetes, the Big Getes. R1b has returned to origins, farming and all the technologies are coming together with the best warriors, to produce the strongest mix, the most competitive hybrid culture. These warriers/aristocracy will conquer the Indus Valley, will produce the big Hittite, Mittani Empires, the IndoIranien and Vedic civilizations. Massageteans/on the Oxus, south of Aral Sea, are in the center of Scythian/Getae/Jet continuum from Dniester to Indus, the Great Scythia. 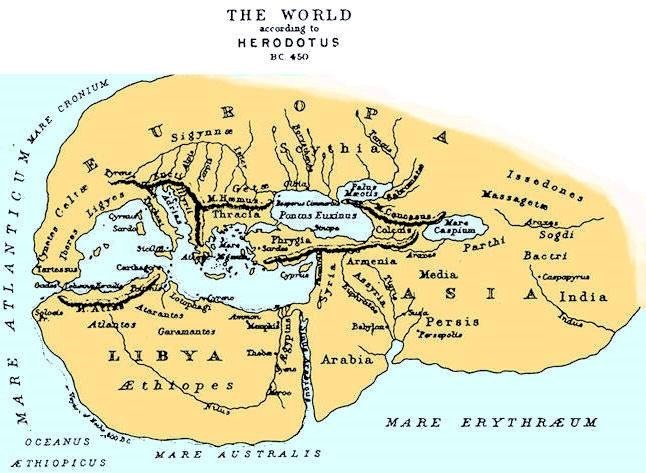 This epicenter on the Oxus river of the Great Getes (the MassaGetes) will produce resistance to Persians & Alexander the Great, will produce the Greco Bactrian Kingdom and the Kushan Empire. The eastern Getes will have a natural affinity with the western Getes, the Macedonians of Alexander the Great. Under the pressure of the rising Turkish populations-the Huns, the most eastern branch of the indo-europeans, the Tocharians / The Yuezhi and the the Hephthalites, with a mixed blood, will produce the last Aryan invasion of the Indian subcontinent. And that is the beginning of the END!! 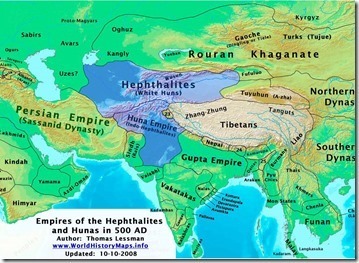 The Huns, the Mongols and the Turks will wipe out the Aryan Getes of the Asia, the Aryan Cultures/States, Turkish populations will become dominant in all the Asia. So again let’s see the cultures going from Cucuteni area to the East, from river to river, aquiring new technologies in time. Above the maximal extent of the Andronovo culture, in orange. 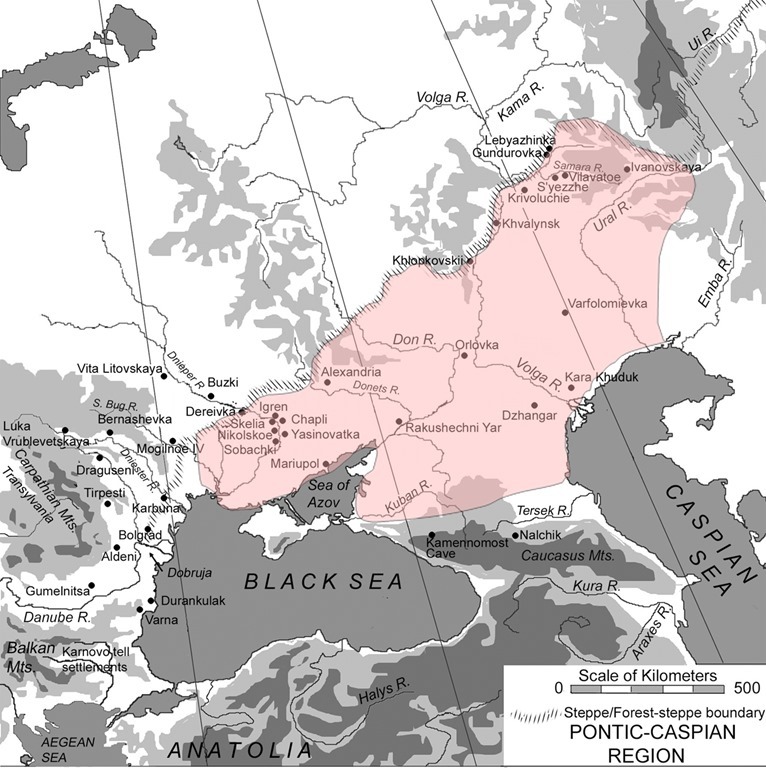 The formative Sintashta-Petrovka culture is shown in darker red. 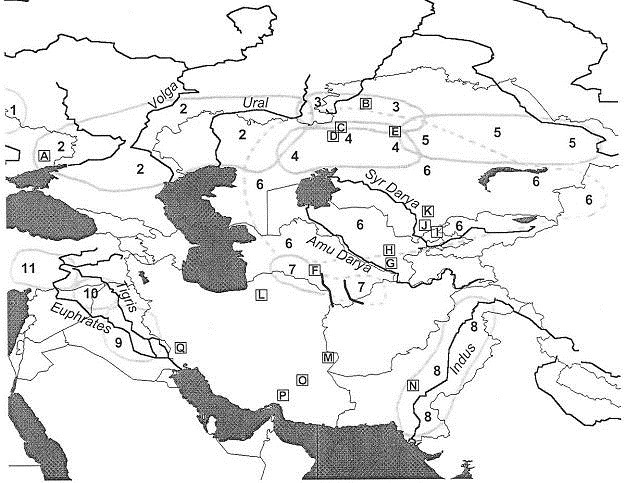 The location of the earliest spoke-wheeled chariot finds is indicated in purple. Adjacent and overlapping cultures (Afanasevo culture, Srubna culture, BMAC) are shown in green. >> 12] Massageteans/on the Oxus, south of Aral Sea, are in the center of Scythian/Getae/Jet continuum from Dniester to Indus. 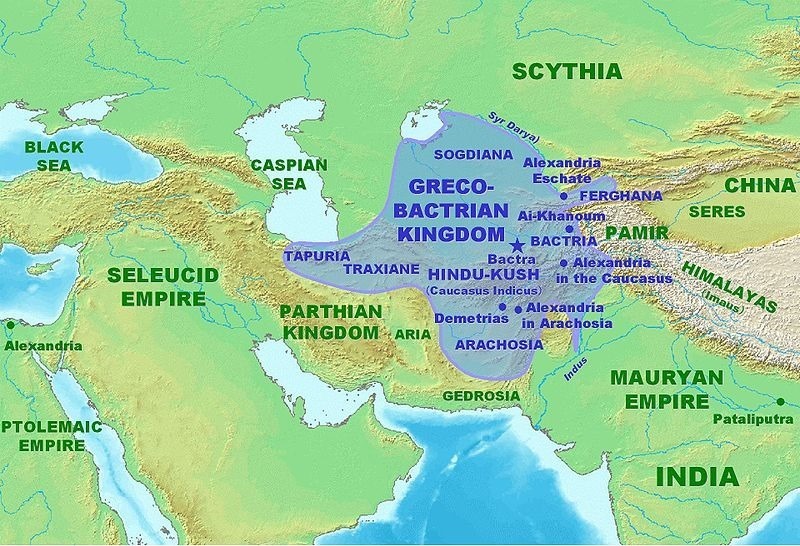 Resistance to Persians & Alexander the Great, the Greco Bactrian Kingdom and the Kushan Empire. >> The Sarmatians were an Iranian people during classical antiquity, flourishing from about the 5th century BC to the 4th century AD. 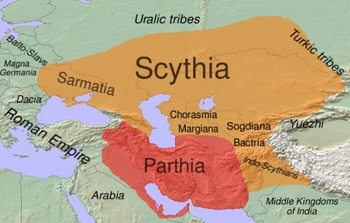 They spoke Scythian, an Indo-European language from the Eastern Iranian family. At their greatest reported extent, around 1st century AD, these tribes ranged from the Vistula River to the mouth of the Danube and eastward to the Volga, bordering the shores of the Black and Caspian seas as well as the Caucasus to the south. 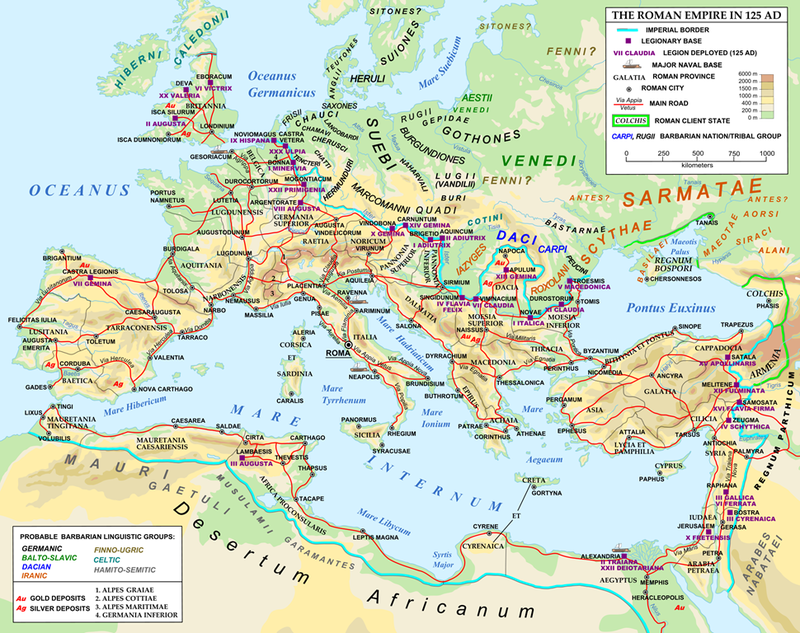 The Sarmatians declined in the 4th century with the incursions connected to the Migration period (Huns, Goths). The descendants of the Sarmatians became known as the Alans. Strabo in the 1st century names as the main tribes of the Sarmatians the Iazyges/Pannonia, the Roxolani/Moldavia, the Aorsi and the Siraces. 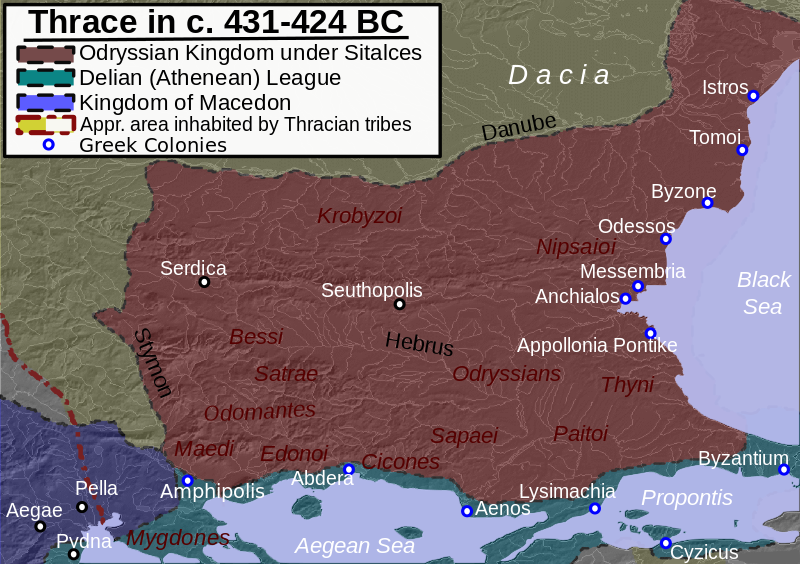 >> The Odrysian Kingdom was a state union of Thracian tribes that endured between the 5th and 3rd centuries BC. 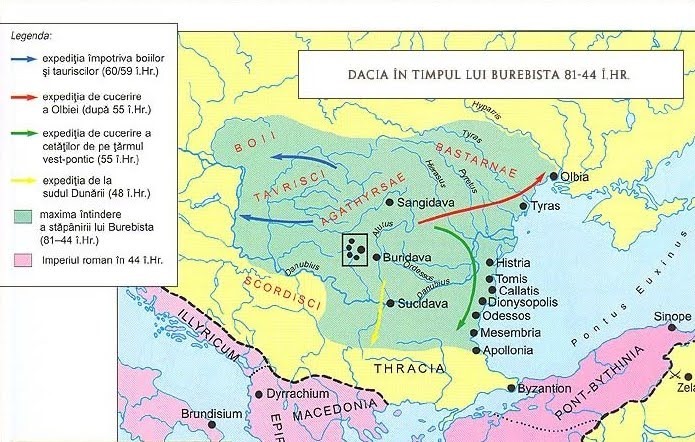 >> Burebista was a king of the Getae and Dacians, who unified their tribes for the first time and ruled them between 82 BC and 44 BC. He led plunder and conquest raids across Central and Southeastern Europe, subjugating most of the neighbouring tribes. After his assassination in a palace coup, the empire was divided into smaller states. #1. The first evidence of extractive metallurgy dates from the 5th and 6th millennium BC and was found in the archaeological sites of Majdanpek, Yarmovac and Plocnik, all three in Serbia. To date, the earliest evidence of copper smelting is found at the Belovode site,including a copper axe from 5500 BC belonging to the Vinča culture. Metallurgists of the Cucuteni Trypilliaculture knew various procedures of copper processing, but also of obtaining alloys, such as the one of copper and silver. To a smaller extent, gold was also being processed, being meant for creating prestigious jewelry. 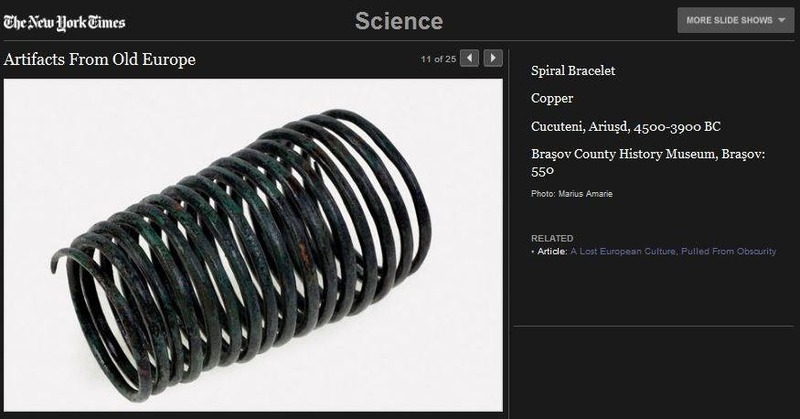 Metal items sometimes accumulated within treasures (such as those discovered in Ariuşd, Hăbăşeşti, Brad, Cărbuna, Horodnica etc.). Thus, the treasure of Ariuşd (Romania) contained 1992 copper items, and the treasure of Cărbuna (Rep. Moldova) brought to light 444 metal items; the treasures of Ariuşd and Brad (Romania) also contained golden items. #2. 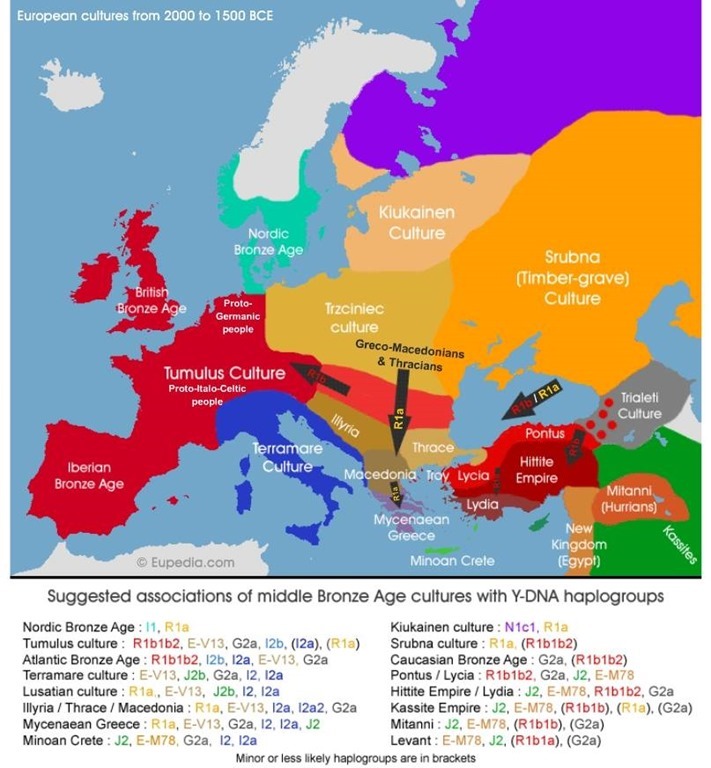 Social changes which began in Eastern Europe and Western Asia around 2300 BC were consolidated across Europe during the Bronze and Iron Ages. Warrior aristocracies developed. Travelling on horseback, warriors could travel long-distances. The invention of the spoked wheel made the war chariot possible. There was a marked increase in the manufacture of weapons. In the Stone Age, axes and daggers could be made, but the long sword was the work of bronze-smiths and clearly a weapon of war. Sheet-metal working developed in the Urnfield Culture of the Late Bronze Age, making possible shields and armour. With this focus on conflict came the development of fortifications. Warfare itself was not new. What we see in the Bronze Age is the development of a society in which the warrior had a special place – indeed a leading role. According to ‘wiki’ the sword developed in the Bronze Age, evolving from the dagger; the earliest specimens date to ca. 1600 BC. 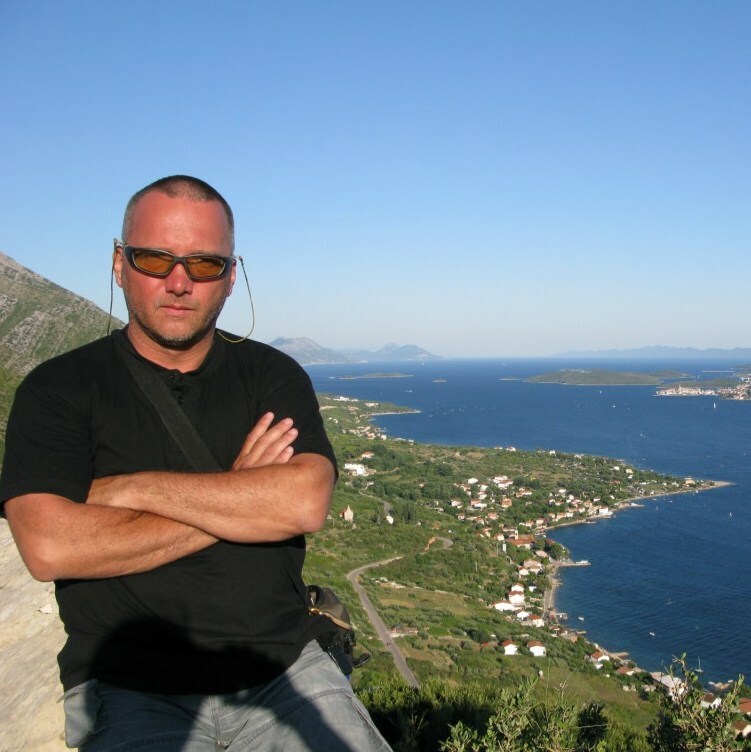 in the Black Sea region and the Aegean. A good article here- The Greek Age of Bronze. 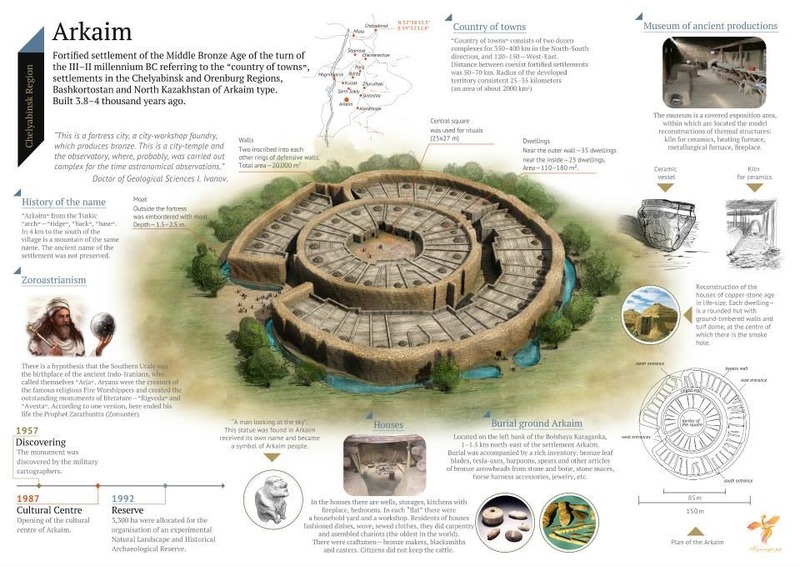 The Mycenaean culture starts around 1700BC when Indus has the first Aryan invasion. The Wietenberg culture was a Middle Bronze Age archeological culture in Central Transylvania that roughly dates to 2200–1600/1500 BCE. 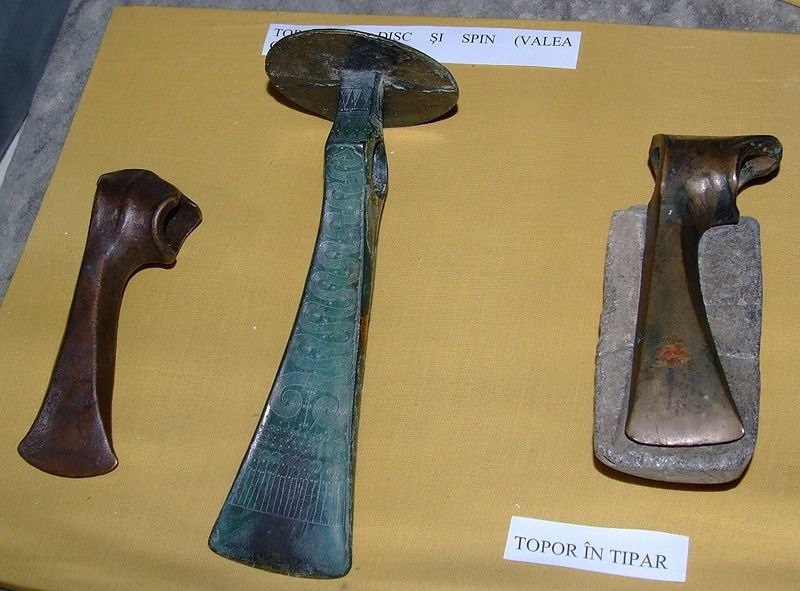 The above pix – Wietenberg culture battle axes found at Valea Chioarului, Maramureş County,Romania. In display at the National Museum of Transylvanian History, Cluj-Napoca and Mycenaean bronze sword found at Dumbrăvioara, Mureş County, Romania. The Mycenians came to Greece from the North of present day Romania, where this sword was found. #3. The shift to cremation rather than interment around 1300 BC, gave archaeologists a name for the burgeoning Urnfield culture. 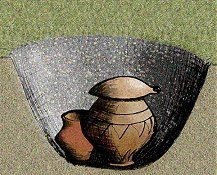 The typical Urnfield burial used a urn to contain the ashes of the desceased, capped by an upturned bowl, set into a pit. 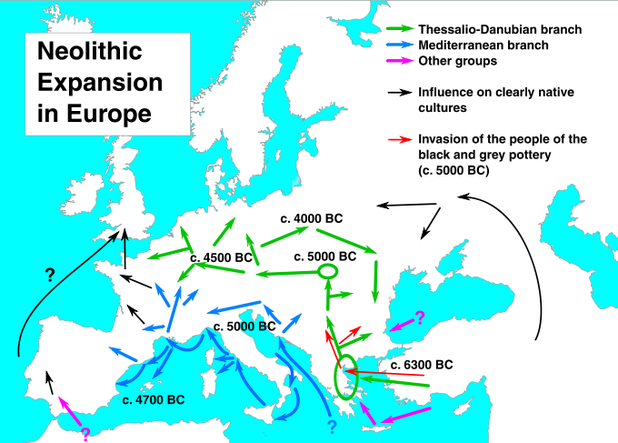 The usage had spread over much of Europe by 1000 BC. Any type of cremation was uncommon earlier over most of Europe except the Carpathian Basin, where it appears among the Makó and Bell Beaker groups as early as c. 2700 to 2400 BC. So this region has often been considered the starting point for the Urnfield tradition. Two of the Middle Bronze Age cultures of Hungary favoured cremation, but only one of them placed a capped burial urn in a pit. That was the Vatya Culture of sheep-breeders living intellsettlements along the Danube. These were well-placed for trading, as well as having good grazing land nearby. So the idea could easily have travelled up the Danube to the trading nexus at its head. From there it spread west and north into Germany and Poland and south into Italy. Finally it moved into France and part of Spain. There was also a transition to cremation burial in Scandinavia and the British Isles in the Late Bronze Age, but without the vast cemeteries of Continental Europe. 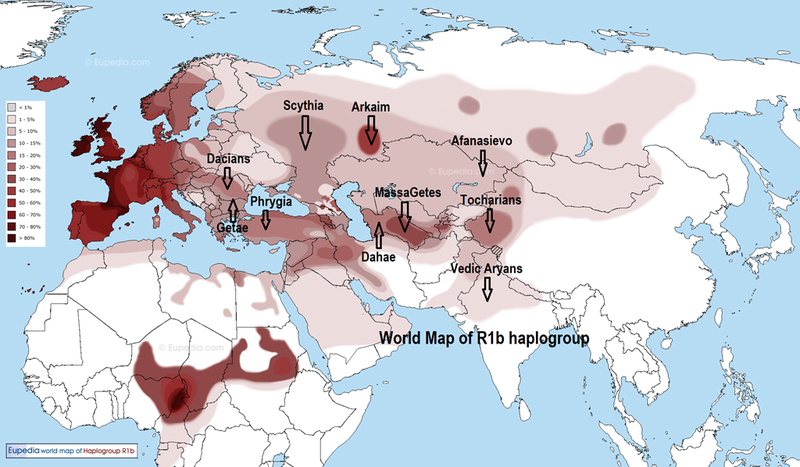 The distribution of the Urnfield Culture is very similar to that of the Y-DNA Haplogroup R1b-U152. 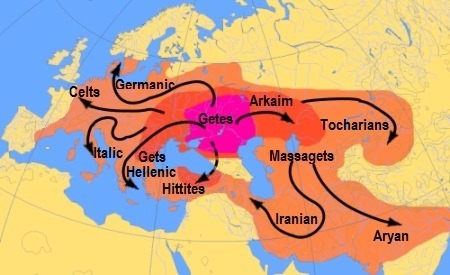 This entry was posted in *****, Aryans, ethnogenesis, Etnogeneza Rumânilor, Getae,Getes,Geti and tagged Arkaim, BMAC, Cucuteni, Getes, Huns, Massagetae, Scythia, The Yuezhi. Bookmark the permalink.